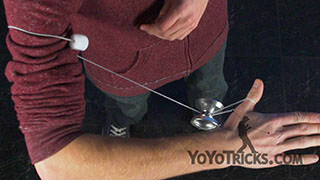 Learn the trick Turbine from Jake Elliott. Turbine starts in a 1.5 mount. From here, you are going to drop the counterweight out of your throwhand. Just let it dangle off of your opposite hand. 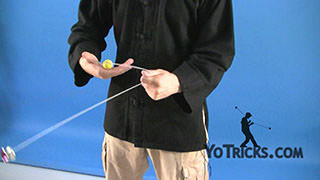 Then you are going to take the bottom three fingers on your throwhand and pinch the string leading to the counterweight. 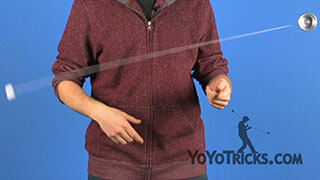 You want to take your thumb on your throwhand and pinch the string that you just pinched with your bottom three fingers against your pointer finger. 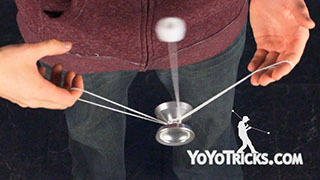 From here you are going to swing the counterweight over top to your throwhand side and roll the yoyo to your throwhand side once. The counterweight is going to land on top of your wrist. 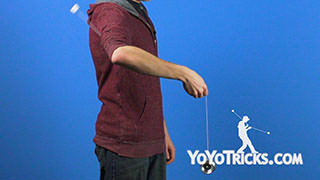 From here you want to pull off with your opposite hand so that the counterweight starts swinging in the opposite direction. 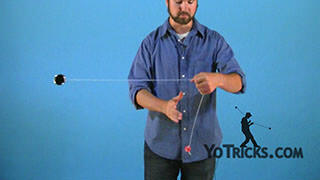 Then you want to swing the yoyo over to your opposite hand side twice, bringing the counterweight underneath your throwhand wrist. Let’s go over that one more time. 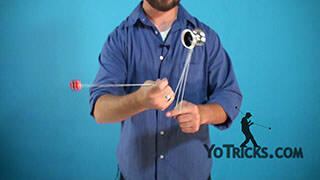 In a 1.5 mount, drop, pinch, swing over to your throwhand side, and swing over to your opposite hand side. 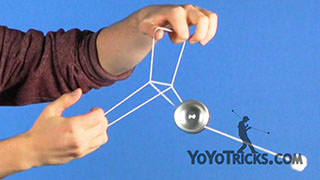 Rolling the yoyo twice and moving the counterweight around once. 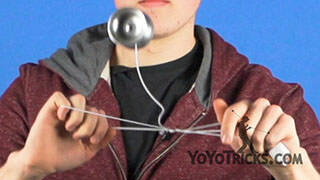 That holds true for the whole trick, so you are always doing one counterweight rotation and two yoyo rotations. You can repeat this back and forth motion as many times as you want. 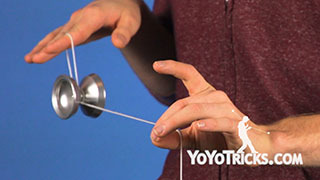 When you are ready to dismount from the trick, you want to roll the yoyo over to your throwhand side and have the counterweight on top of your wrist. 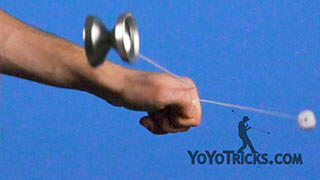 Before we move on to the dismount, there is a special way that you need to set up your throwhand. Rather than having your hand set up like this, with your bottom three fingers and your pointer finger at a right angle, instead you want to push your pointer finger forward and pull the bottom of your hand back. 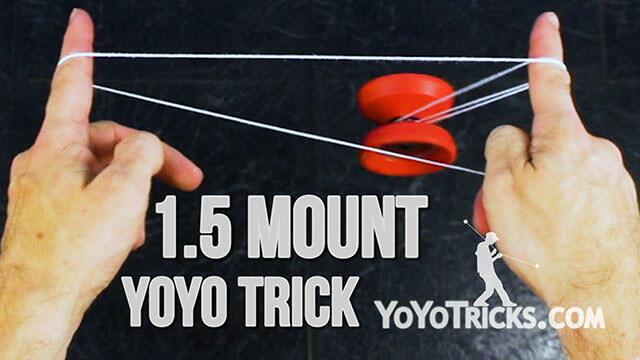 This increases the distance between the yoyo and the counterweight string, which is going to make the dismount much easier to perform. 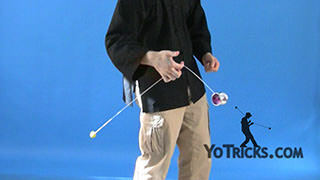 Once you have that in mind, and you are in this position, you want to pull the counterweight towards your opposite hand side. 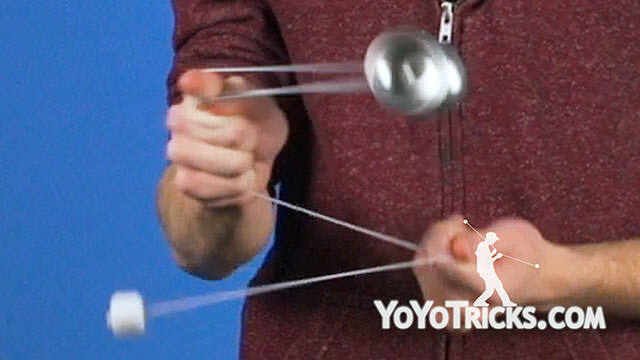 Rather than holding on to the counterweight string like we were earlier in the trick, instead you want to let go and let the counterweight swing around your wrist twice. 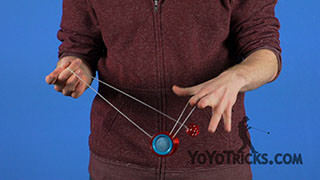 When you are doing this, you also want to roll the yoyo toward your opposite hand twice. When the counterweight goes around your wrist, it is really important that the counterweight goes around almost exactly two times. 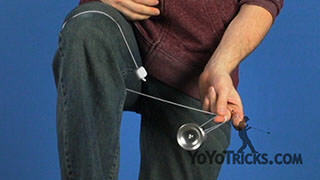 You will see that the counterweight string starts in my thumb and it goes around my wrist, and it ends right at the level of my thumb. 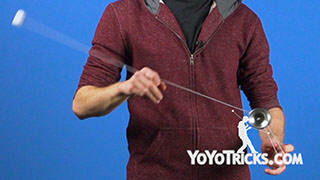 This string proportion helps a lot with the timing of the dismount. When you are doing this, if you find that the counterweight string is too long, that means that at the beginning of the trick, in the 1.5 mount, you need to give the yoyo more string, if the counterweight goes around your wrist less than twice, then you need to give the yoyo less string in the 1.5 mount. Once you have the counterweight around your wrist, then you need to get ready for the dismount. 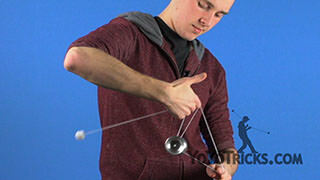 To do this you are going to make a big circle motion with your throwhand, which is going to kickstart the counterweight on its rotation. 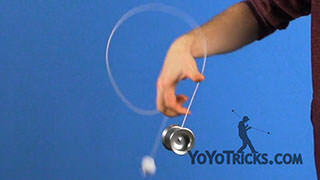 You want to roll the yoyo toward your throwhand side, twice. The dismount looks like this. You want to drop the loop on your pointer finger right when the counterweight reaches this position, when it is no longer wrapped around your wrist and it is pointing parallel to the ground on your throwhand side. 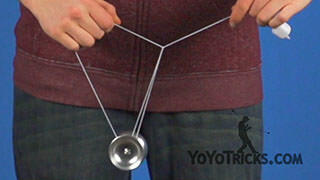 Once the counterweight reaches that position, you want to drop the loop on the yoyo. 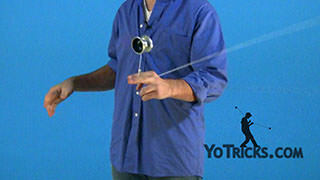 Both the yoyo and the counterweight are going to be swinging toward your opposite side. 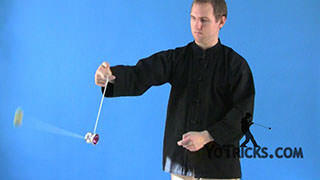 Then you want to catch the counterweight in your non throwhand. 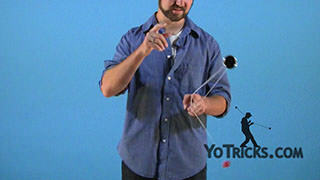 Swing the yoyo into a opposite side trapeze and his brother. Then you can do a trapeze and his brother switch. 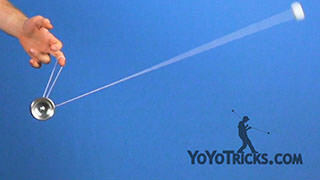 You can do another switch by dropping the counterweight, swinging into a trapeze. From there, you can perform a bind. And that is Turbine.